This high quality furniture is made from high-density plastic with fade resistant colors throughout each board. This furniture never needs paint. It is fade-resistant. It will not rot. Salt water and chlorinated water have no effect on it. It is meant to weather the ocean shores and the harshest winters. Made in the U.S.A with 90% recycled Plastic and stainless steel hardware. 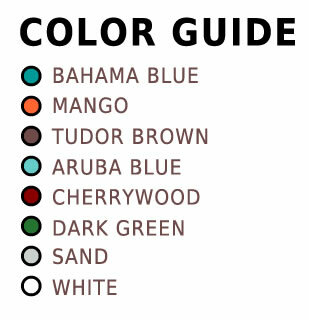 Colors: Bahama Blue, Mango, Tudor Brown, Aruba Blue, Cherrywood, Dark Green, Sand, White. 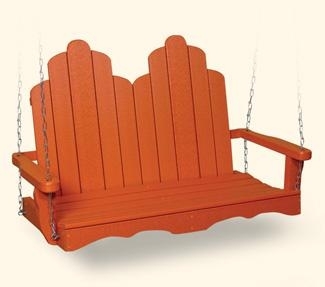 Dimensions: W: 49.5" x D: 23" x H: 31"; 60 lbs. Assembly: Chain included. This furniture may require some assembly.